Consumer Confidence Fell Sharply This Month; Shutdown Blamed : The Two-Way The 16-day partial closing of the federal government and the wrangling in Washington combined to make many Americans nervous, the private Conference Board says. On the plus side, home prices continue to rise across the nation. The 16-day partial shutdown of the federal government and the wrangling in Washington over the nation's finances combined to shake consumers' confidence sharply in October, the private Conference Board reported Tuesday morning. Its widely watched consumer confidence index dropped to 71.2 from 80.2 in September. How consumers are feeling is an important economic indicator because they purchase about 70 percent of all the goods and services that businesses produce. If consumers scale back their spending because they aren't feeling like things are going well, that can set off an unfortunate chain of events: soft sales that lead companies to postpone hiring or shed some workers, moves that then make consumers feel even more nervous and more reluctant to spend. In Tuesday's release, Conference Board economist Lynn Franco says that "the federal government shutdown and debt-ceiling crisis took a particularly large toll on consumers' expectations." "Similar declines in confidence were experienced during the payroll tax hike earlier this year, the fiscal cliff discussions in late 2012, and the government shutdown in 1995/1996. However, given the temporary nature of the current resolution, confidence is likely to remain volatile for the next several months." -- Home prices in 20 major cities across the nation were up an average 12.8 percent in August from the same month a year earlier, according to the latest S&P/Case-Shiller Home Price Indices report. In a statement with the report, economist David Blitzer says S&P/Case-Shiller's 10-city and 20-city indexes both "showed their highest annual increases since February 2006." While prices are still on the rise, though, there has been some slowing in the pace. "The monthly percentage changes for the 20-city composite show the peak rate of gain in home prices was last April," Blitzer adds. "Since then home prices continued to rise, but at a slower pace each month. This month 16 cities reported smaller gains in August compared to July. Recent increases in mortgage rates and fewer mortgage applications are two factors in these shifts." 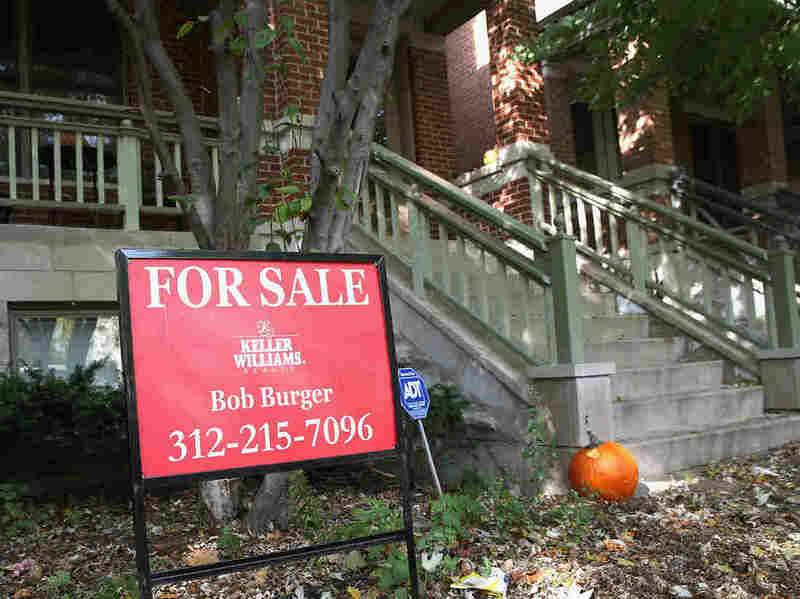 A "For Sale" sign outside a home in the Wicker Park neighborhood of Chicago on Monday.